This was a very popular desiogn in its period and as an antique is highly prized today. Is is also referred to as a Tray-Top table due to the deep moldes top edge which gives it a tray like appearance. 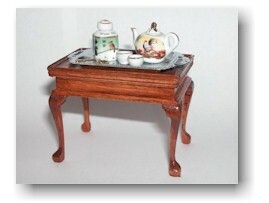 Although it was primarily used as a Tea Table many other uses were forund for it. It's graceful cabriole legs were either left plain or were decorated with shell carvings on the knees. The skirt was either plain, or molded as in my version. Other versions also has a scroll valanced lower edge. Pull out candle shelves at each end are found on some, and some very rare versions had a shallow drawer on the side. I made this table from a furniture kit from 'The House of Miniatures Collection'.